As appeared in The Times Tribune on December 13, 2018 by Jim Lockwood. JAKE DANNA STEVENS / STAFF PHOTOGRAPHER A pedestrian crosses Spruce Street in Scranton on Wednesday. 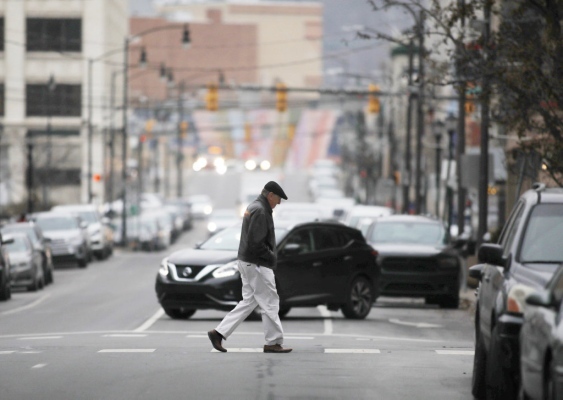 SCRANTON — The city can start making the downtown more walkable and pedestrian-friendly by taking small steps, an urban-design expert said in a lecture Wednesday at the University of Scranton. 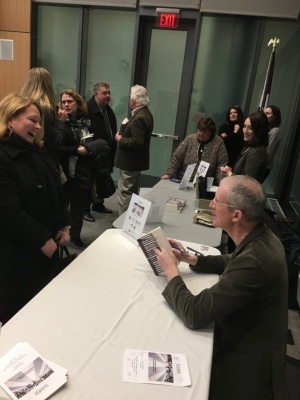 Jeff Speck, a city planner, consultant and author of the 2012 book “Walkable City: How Downtown Can Save America, One Step at a Time,” gave a lecture at Leahy Hall’s Kane Forum. ■ Re-stripe roads to create narrower vehicle travel lanes. Vehicles tend to drive more slowly on narrower roads, and re-striping also is less expensive than reconstructing roads. ■ Eliminate push-button signals for crosswalks. Instead, have pedestrian-crossing signals automatically timed to coordinate with green lights or better yet, have signals timed to give pedestrians a head start to cross while all traffic stopped. A pedestrian should never have to ask for a walk signal. Crosswalks that only give a pedestrian go-ahead signal when pushed “is not what you find in walkable cities,” he said. ■ Eliminate one lane of multi-lane, one-way streets to slow down and curb jockeying of vehicles among lanes, specifically in applicable areas of Spruce and Linden streets and Adams and North Washington avenues. ■ Convert, if possible, some one-way streets to two-way streets, possibly Clay and Monroe avenues. Generally, some one-way streets actually can be more dangerous than two-way streets. ■ Create four-way stops at two-way intersections. ■ Add bicycle lanes in streets, which also narrows vehicle travel lanes. ■ Reduce overall widths of some of the wider streets. ■ Four-lane areas of Mulberry Street and Wyoming Avenue also could be reduced to three vehicle lanes and a bicycle lane, without disrupting vehicle traffic flow. About 100 people attended the event presented by the Greater Scranton Board of Realtors, Lackawanna County and the Scranton Tomorrow, a nonprofit organization leading downtown economic development efforts. Scranton City Councilman Wayne Evans learned of Speck from downtown developer Charles Jefferson, who gave Evans a copy of Speck’s book. A downtown resident and former member of the city planning commission, Evans was hooked. He bought a dozen copies of the book and handed them out with the goal of getting Speck to speak in Scranton. Speck’s ideas and message about the importance of walkability “strike at the heart of what I believe is needed for our city,” Evans said. “We hope to build on tonight’s message and this into a movement, to make our city more walkable and make our downtown and Scranton into the amazing place we all know it can be,” Evans said. Speck’s 90-minute-long, wide-ranging address also included an overview of traditional city designs, sprawl and urbanization movements. Various factors — including speed limits, parking, housing, and sizes of blocks in downtowns — all can affect walkability. After the lecture, several people said they found it interesting and thought-provoking. Ronda Beemer of Clarks Green works in downtown Scranton as director of business development for Quandel Construction Group in the 200 block of Wyoming Avenue. She bought one of Speck’s books during a book-signing.